Daily newspapers like The Dallas Morning News made the Bonnie and Clyde posse members household names for a short while, but over time, Frank Hamer’s role has overshadowed the other five, including Bienville Parish, Louisiana, Sheriff Henderson Jordan. No knowledgeable Texan doubts that Ranger Captain Frank Hamer deserves the credit for running down and staging the execution of the notorious gangsters Bonnie and Clyde. The story is firmly embedded in the Texas narrative, a highlight of Lone Star history no true Texan would dare challenge. Throughout the 1920s Hamer—big and muscular, tough, fearless, honest, a man of few words—was the best the Texas Rangers had to offer. Only Tom Hickman came close to Hamer’s record in fighting bank robbers, bootleggers, moonshiners, gamblers, lynchers and corrupt politicians. His signature weapon was not a Colt pistol but the palm of his huge hand, which he cocked at the shoulder and swung in a slap that swiftly downed an opponent. 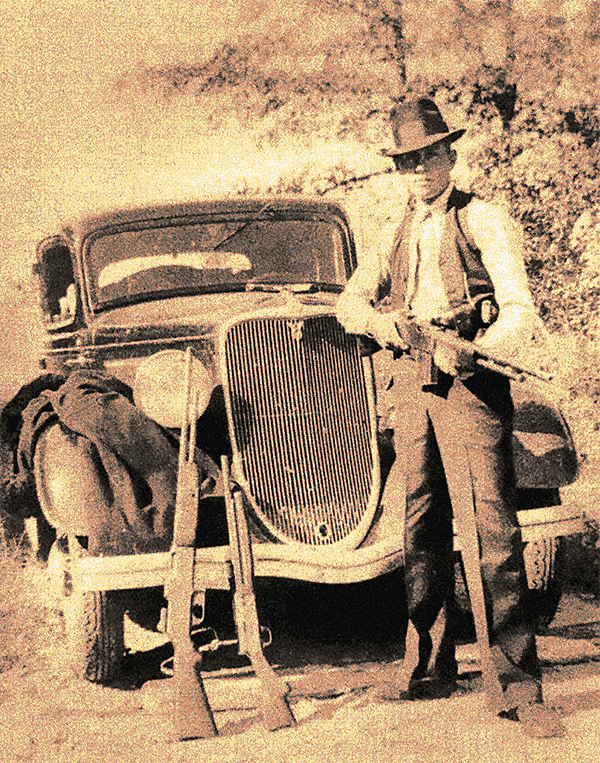 Clyde Barrow, holding his military grade BAR machine gun, posed in front of his Ford V-8 with more of his gang’s firepower, including another BAR and pump shotgun, circa 1932. But during the saga of Bonnie and Clyde, Frank Hamer was not a Ranger captain. The election as governor in 1932 of Miriam A. Ferguson promised a revival of the corruption that had ruled the capitol during the earlier reign of her husband, James E. Ferguson, who could not run because he had been impeached. Everyone knew, however, that “Pa” Ferguson would use “Ma” Ferguson to carry out his own designs. Foreseeing the fate of the Rangers, Hamer resigned a month before her inauguration. On that very day in January 1933, she fired every Texas Ranger and substituted political cronies. Bonnie and Clyde still ran wild. 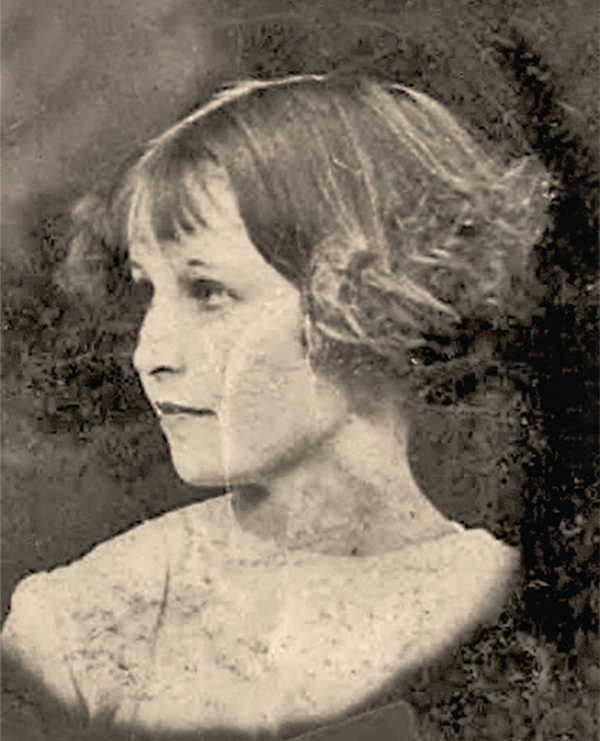 Bonnie Parker, raised in poverty in Cement City across from Dallas, was married for three years before she met Clyde Barrow at her brother Buster’s house in West Dallas in January 1930. It was nearly love at first sight. Bonnie Parker and Clyde Barrow were but two of the gangsters who rampaged through the early 1930s. John Dillinger terrorized the entire Midwest, mobilizing lawmen in their most severe challenge and commanding the greatest national publicity. Others included Baby Face Nelson, Machine Gun Kelly, Pretty Boy Floyd and Ma Barker. None came near matching the record of John Dillinger. While genuine gangsters (except for Ma Barker), their exploits were exaggerated in later years by J. Edgar Hoover seeking to portray his fledgling Bureau of Investigation (future FBI) as masterful crime-fighters; in the early 1930s they were rank amateurs. Bonnie and Clyde, their trademark an arsenal of high-powered weapons and a sequence of high-powered automobiles, although on occasion swinging murderously through neighboring states, confined most of their killings and robberies to Texas. Few newspapers beyond Texas, preoccupied by Dillinger, paid them much attention. 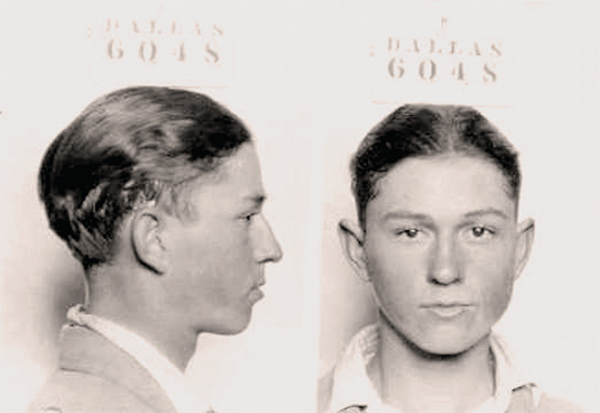 Clyde Barrow’s mugshot at 16 after being arrested for auto theft in December 1926. But the pair, joined at times by other aspiring criminals, constantly eluded Texas lawmen. 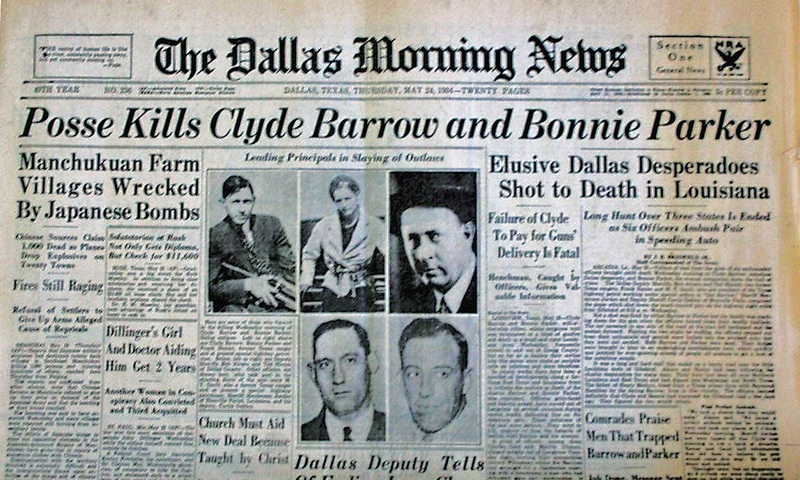 Especially shocking, on Easter Sunday 1934, as Bonnie and Clyde and their sidekick Henry Methvin lounged in their Ford on a roadside near Dallas, two passing motorcycle patrolmen turned back to investigate. While still astride their cycles, Methvin jumped from the rear seat and emptied a Browning automatic rifle into the first officer, while Barrow emerged from the driver’s seat to blast the second with a sawed-off shotgun. Less spectacular, another event had already set in motion the operation that would finally snare them. In January 1934 they engineered the escape of three cronies, including Methvin, from the state penitentiary’s prison farm. One guard lost his life in the shootout as the escapees piled into Bonnie and Clyde’s car and sped away. 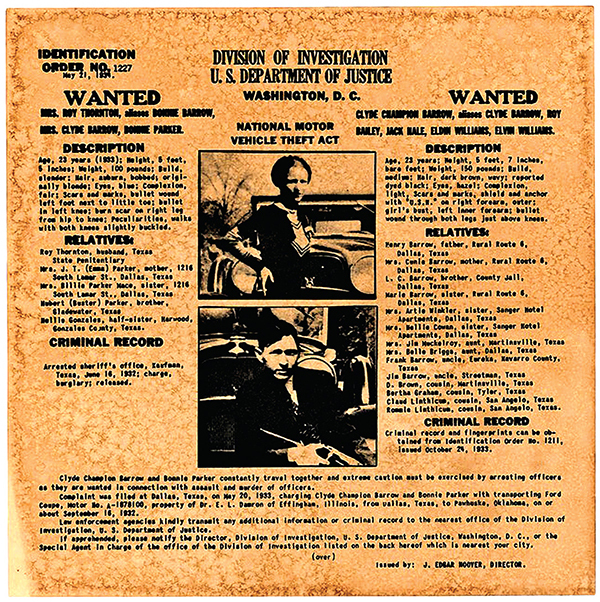 The U.S. Department of Justice, Division of Investigation’s identification order for Bonnie Parker and Clyde Barrow was issued two days before they were ambushed and killed near Gibsland, Louisiana, on May 23, 1934. Angry and chagrined, the director of the state prison system, Lee Simmons, vowed to capture or kill the gangsters. In Austin he persuaded the governors “Ma and Pa” Ferguson to allow him to commission a special officer of the prison system to take on the task. Surprisingly, they concurred in his choice of former Ranger captain Frank Hamer. Bob Alcorn, a Dallas deputy sheriff who could identify the wanted pair, joined Hamer. 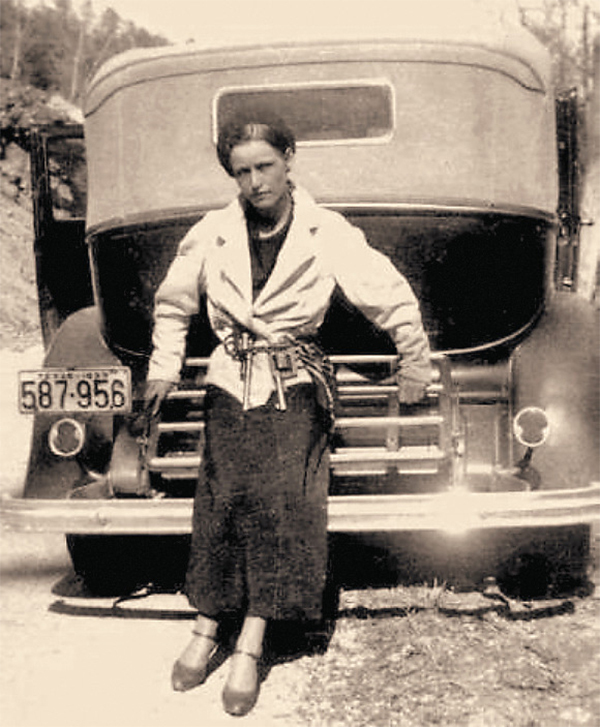 In April 1933, Bonnie Parker posed with her sidearms for Clyde behind a car they stole from Bob Rosborough in Marshall, Texas. The two Texans gained information that pointed to Bienville Parish in northwestern Louisiana. In the parish seat of Arcadia, they discovered that Sheriff Henderson Jordan had already located one of Bonnie and Clyde’s hideouts and had been handed an opportunity that might trap them. Henry Methvin’s parents moved from Ashland to Gibsland, and the gangsters frequently hid there. Through an emissary, Methvin offered to betray his comrades. With a signed promise from Governor Ferguson to pardon him for all crimes committed in Texas if the plan succeeded, he would alert the sheriff when Bonnie and Clyde took refuge near Gibsland. Frank Hamer journeyed to Austin and returned with the signed document. The intermediary passed it on to Henry Methvin. 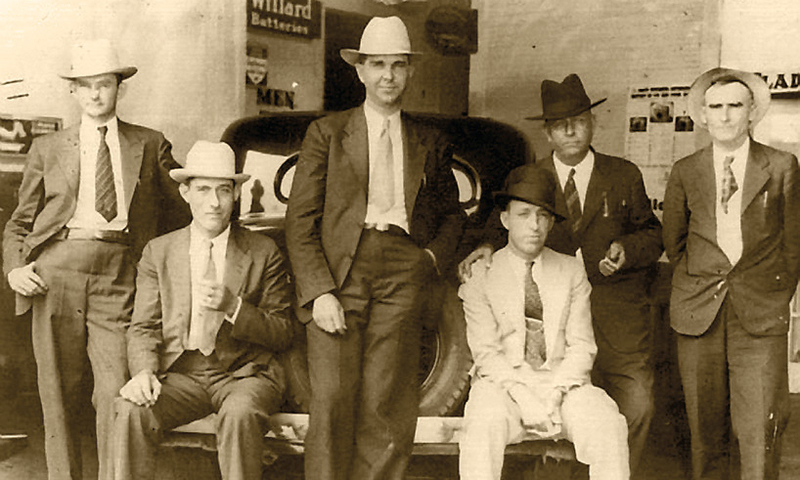 After the killing of Bonnie and Clyde, the six key lawmen who chased them down posed for the history books: (l.-r.) Prentiss Oakley, Bob Alcorn, Louisiana Sheriff Henderson Jordan, Ted Hinton, Frank Hamer and Maney Gault. As the weeks passed, the task force expanded. The murder of the Texas highway patrolmen on Easter Sunday prompted State Patrol Chief Louis Phares to insist on a role in the hunt. Hamer chose a former Ranger colleague, B. M. “Maney” Gault, whom Chief Phares commissioned in the highway patrol. Another Dallas deputy, Ted Hinton, joined the team. With Sheriff Jordan and one of his deputies, Prentis Oakley, the posse numbered six. The four Texans waited impatiently in a Shreveport motel. Not until May 21 did they get word that Bonnie and Clyde were at Ivy Methvin’s hideout outside of Gibsland, near the crossroads of Sailes. Methvin would give them the slip in Shreveport. They had agreed that if accidentally separated, they would rendezvous at the abandoned farmhouse hideout. Armed with BARs, shotguns and Colt automatics, the six lawmen positioned themselves behind brush at the side of a gravel road leading through heavily forested land to Gibsland. Methvin’s father parked his logging truck across the road and would feign a flat tire. On April 1, 1933, Bonnie and Clyde, along with Buck and Blanche Barrow, and W.D. 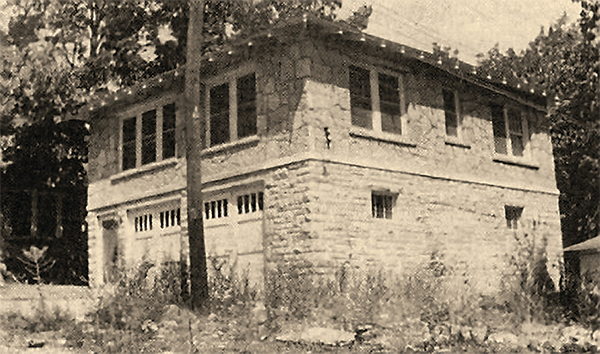 Jones hid out in this rented apartment in Joplin, Missouri. Less than two weeks later they were on the lam again, with two dead Joplin policeman left in their wake. On May 23, after two nights and a day in the brush, the officers agreed that they’d waited in vain and prepared to leave. The high whine of a speeding Ford V-8, however, alerted them to the approach of the culprits. Methvin’s father played his part, and the Ford eased to a stop beside his truck. An approaching timber truck prompted Clyde to make room for it by steering his vehicle to the front of Methvin’s truck. Deputy Oakley, anxious not to lose the target, fired two rounds from his BAR. The others opened with all the weapons they had, shredding both car and occupants for the enduring images that splashed the front pages of newspapers everywhere and remain indelibly fixed in gangster lore. Bonnie and Clyde died by the very weapons they treasured and had packed into the death car. Two months later, accompanied by a woman in a red dress, John Dillinger emerged from a Chicago theater into a hail of bullets that ended his career. The era of the big-time gangsters drew to a close. Frank Hamer returned home to public acclaim. Newspapers and magazines hailed him as the man who had run down Bonnie and Clyde and organized the ambush that ended their crime spree in a shower of blood and shattered glass. He was a hero to all Texans and remains so to this day. Scholarly support came from the respected historian Walter Prescott Webb, whose history of the Texas Rangers appeared a year later. He confined his narrative of Bonnie and Clyde to the words of Hamer himself, interviewed within months after the ambush. As Webb later conceded, it was an interview cobbled together from handwritten notes scrawled on cards as he talked with the legendary captain. With people and places still to be protected, Hamer talked vaguely, with little explicit detail, and at times misleadingly. Yet the “interview” remains the authoritative account in a book that has never been revised or gone out of print. 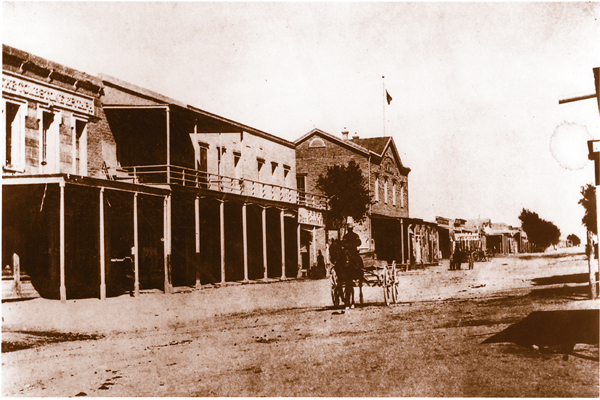 Sheriff Henderson Jordan, however, was the true architect of the scheme. He located the hideout, received the offer of betrayal from Henry Methvin’s emissary and organized the ambush. 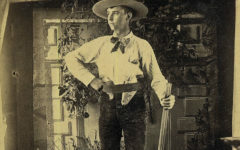 Hamer is entitled to credit for acting as a messenger to Governor Ferguson and for participating with the five others of the posse in gunning down the fugitives. He did not track down Bonnie and Clyde. Tell that to a Texan. 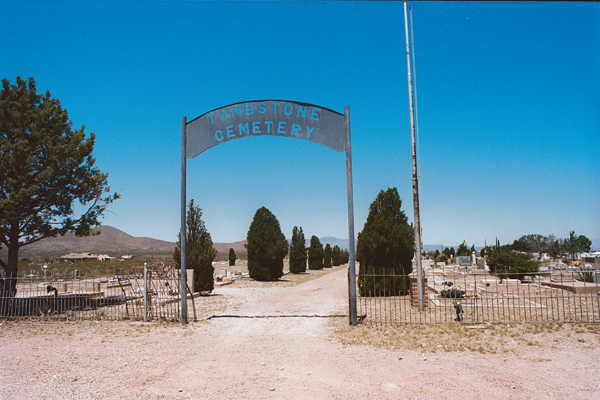 May They Rest in Peace The graves of Tombstone’s famous and infamous.